HomeSkin & HairBrazilian Hair Extensions Are HOT! Bored of Your Hair? Go Brazilian! Next we are about to elaborate on some qualities that you should focus on when choosing a hair bundle for your hair. The most important factor is of course its matchiness with your natural hair – you want extensions that naturally blend in with your own hair. Otherwise it will look wonky. This really can’t be emphasized too much. What you want is a perfect match with your natural color – even the tiniest difference in tone will be noticeable. If you don’t want people to recognize that you are using fake hair and are overly self-aware, the smallest possibilities will eat your confidence. If you are uncertain of the color match (in case you are buying your hair bundles online for example) there’s no need to worry: as these extensions are made of real hair you can dye them later just like you can your own hair. You’ll always be able to get a perfect match even if they don’t match right “out of the box”. Or you can use them in sections to make them look like highlights. Yes, the same rules apply here: just as you could your own hair you can cut the hair extensions too. But why pay more for a longer bundle if a shorter one would suit you better? One thing to keep in mind that a hair extension will always appear a little longer once its attached as it will be clipped onto your existing hair. Generally speaking all hair extensions fit the following three categories: curly, straight and wave. You don’t have to be a professional hair stylist to realize that using curly hair extensions on straight hair is not a great idea, but you are of course free to experiment. You are able to straighten and perm virgin hair extensions but if you go with a lesser bundle (synthetic) at least make sure it is heat-friendly. 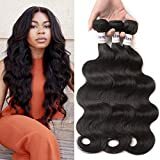 Hair Weight&Length: Full Head Brazilian Virgin Hair 3 Bundles.Each bundle is 95g-100g (3.3-3.5oz),For the length, stretching the virgin hair to be STRAIGHT then measure it. Delivery Time: amazon prime Fast Free Shipping, 1-3days you can receive it. We, as provokers, start off with a bold statement: curly hair looks more natural, fresher and even healthier than straight hair. Well, this is of course a matter of preference but we got your attention now didn’t we? By choosing a correct color to match your own hair and a proper virgin hair extension it will be hard, if not impossible, to tell the difference between your extensions and your genuine human hair. 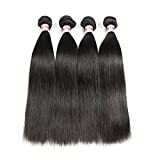 Exquisite Craftsmanship: 100% unprocessed Brazilian hair Extension, Brazilian human hair bundles cut from young healthy beautiful lady donors with more bounce. Grade 8A quality guarantee. Every bundles has been seriously manicure and quality controlled by our skilled professional workers. Ushow hair make you more attractive. Premium Double Weft: Ushow Brazilian deep wave hair is Machine double strong weft, tight, neat, full. Our Brazilian virgin hair bundles is Tangle free and Shedding free. 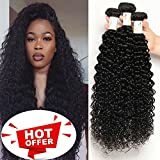 This Brazilian Virgin Hair Deep Wave 3 Bundles with closure deal will surprise you and make people jealousy of you. 3 Bundles Enough Full Head: The deep wave Brazilian remy virgin 100% human hair, touch soft and thick, look Bouncy. High elasticity, Last longer. 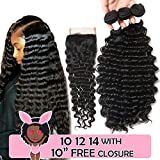 These Virgin hair bundles with a closure is enough for a full head, but if you want super thinker, you came with a closure together in our store. Healthy Ends: This unprocessed virgin Brazilian hair No spilt ends, No dry ends. No shedding. No slices. Can be Straightened, Curled, Bleached and Styled as your own. 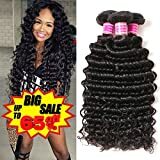 30 Days Return or Refunds Guarantee: The virgin deep wave human hair can be last at least 3-4 month with careful manicure. Don't hesitate to contact us if you don't satisfy with our product. 30 Days Return or Refunds policy to assure you make a happing deal with us. 1.VRBest - The United States Trustworthy Brand, Sell 100% Unprocessed Virgin Human Hair Extensions Deep Wave Bundles. Your Best Hair Brand Choice. 3.Hair Color: Natural Black Color 1B Human Deep Wave Bundles, Can Be Dyed and Bleached Well. 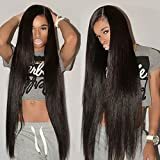 4.Hair Weight&Length: 95-105g/bundle, 3 bundles/order,multiple choices,8inch-26inch;For the length,stretching the hair to be STRAIGHT and then measure. ❀SHOW YOUR BEAUTY❀: LiangDian human hair can be dyed, Bleached and restlyed according to your expectations.You can Shaping different hairstyles when you in different situation. It makes you unique in any place and you always attract everyone's attention. 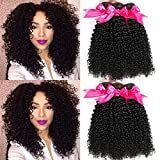 ❀CURTICLES HOLD BODY WAVE HUMAN HAIR❀：The brazilian virgin 100% human hair is very soft, thicker, bouncy, silkey, high elasticity. Curticle and hair is in one direction. 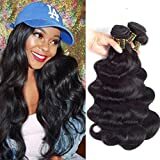 This body wave bundles will let you be a fashion lady and make people jelous of you . 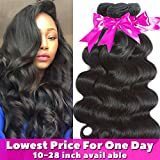 ❀EXQUISITE CRAFTSMANSHIP❀：LiangDian 100% human virgin hair bundles which is cut from young healthy beautiful female donors with more bounce.The body wave hairs are Grade 7A quality guarantee with assured workmanship.Every hair bundle has been seriously manicured and quality controled by our skilled professional workers. 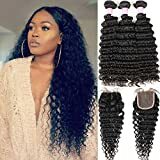 ❀PREMIUM DOUBLE WEFT❀：Machine double strong weft make it tight and neat,not Layered .Our body wave brazilian human hairs no shedding and tangle free,no smell.You can sew in very safe without so much headach . LiangDian body wave virgin hair is your first choice . ❀WORRY-FREE AFTER SALES❀: About The LiangDian virgin hair bundles , No Risk Purchasing. We offer 24H online customer service. If u meet any problems,please contact us free feel.We will try our best to solve it. Once again, there is no rocket science behind this: if you want your hair extension to look completely natural, buy one that IS 100% natural. 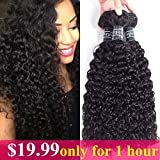 As we mentioned above, another advantage of virgin hair extensions is the fact that they can be treated like real hair – cut, dye, style, you name it. You can even wash and blow-dry them just as you would your natural hair. These are things that you can’t do with most synthetic hair extensions. 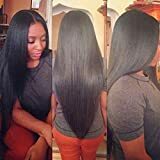 Virgin hair is unprocessed (no chemicals, no artifical hair color etc) that is collected from a single hair donor – untouched, as the name would suggest. So when you buy virgin Brazilian curly hair you can rest assured that the hair is naturally curly. Remy hair is also collected from a single donor with the cuticles still intact, but it may have been processed at some point of its lifetime. So, not all 100% human hair qualify as virgin or remy. Unless it matches the strict criteria of these mentioned above, it may have been collected from the floor of a salon for example and then recycled. Could not find anything for your taste? Take a look at Malaysian curly hair bundles!